Some nonprofits will need to look beyond the traditional board recruitment matrix skill sets that have been used for decades – human relations, communications, financial. Example of change: The usual profile of nonprofits board members are people in the 25 – 50 year age bracket. Many of them are in the midst of building careers and, although they be counted on to complete specific projects, they are frequently unable to rigorously fulfill their governance responsibilities. They tend to follow the governance guidance presented by the board chair and/or ED. As a result, forward looking boards are now looking to recruit semi-retired or retired persons with board experience and time to devote to governance. They serve as role models for the younger persons and provide board staffing critical audit committees. To do anything less can lead to personal liabilities for board members. 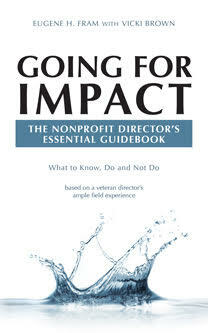 In summary, the Harvard Forum Report in my opinion suggests, Nonprofit boards in 2014 [M]ust recruit and retain high quality directors who are willing to shoulder the escalating workload and time commitment required for board service. Nonprofit boards need to tailor the board’s role in overseeing risk management to the specific needs of the organization. I recently heard of a California health care nonprofit where the failure of the board to oversee compliance with heath care regulations led to the bankruptcy of the nonprofit. To reduce the risk level some nonprofits may occasionally need a forensic review of operations. A standard annual audit does not test for fraud. With the 28 enhanced questions related to governance now found on the IRS Form 990, boards need to understand that there may be organizational risk to its tax status if board members are not involved with the development of the form each year. I have personally witnessed situations where the directors were never given a copy of the Form 990 or it was completed internally by management and simply passed out at a board meeting. In addition, I even encountered one, which had no D&O insurance policy, even though it was responsible real estate property worth $24 million. Organizational risk in terms of personal liability, organizational continuance and board talent development should be on nonprofit board improvement agendas in 2014. As experienced nonprofit managers have concurred for decades, once a quality board and staff are in place, other problems can be more easily solved. In the UK’s not for profit sector, the opposite seems to be true.Most Board members are over 60 and many are in their 70s. Attracting younger Directors is the difficulty. Most younger people do not have enough time available to give. However the Coaltition’s policy on younger volunteering might help reverse the trend.